The bush at Creswick is the largest of the Ballarat series of paintings that Matthew Moss completed for an exhibition in Sydney at the Bloomfield gallery during the years he stayed in Australia. in the 1850's Creswick township was one of the first places where gold was discovered in Australia and where more than 25,000 gold miners gained and lost fortunes. Nearby, in the town of Ballarat was the gold-mining exchange founded in 1887, the principal centre for buying and selling shares of mining companies, and financing the minefields. Matthew discovered the gold exchange soon after he arrived in Australia, when by then it had been abandoned for decades but, happily, still retained many of its beautiful original Victorian features including its superb original glass and carved timber vaulted roof. The artist decided to restore it to its original state and for many years used it as his studio and where it became the centre for conservation for the many art museums in the surrounding state of Victoria. In its heyday intensive gold mining upended the whole Creswick area. Now regrown bush and generations of wildlife have obliterated the ravages of mining - no signs remain of the boom and bust of the gold mining that was carried on here. The original painting was a small acrylic sketch executed onto canvas board and that the artist painted in the bush. The work was of horizontal dimensions and thus accommodated a more widely spaced group of trees. In the final painting these were reduced to the half dozen or so now visible. In somewhat the same manner as "The pot plant" the artist reduced the trees' foliage to graphic elements. Against a very light background in yellow, a deeper mixture of cadmium yellow and yellow ochre has been used to create a mass of meshed and woven tangled forms and lines streaming down from the top of the canvas to meet the tree trunks to assume more conventional forms. These are painted in a mixture of light yellows, orange, olive greens and white with each tree limited to one or two colours giving the impression of a two colour negative. In the lower half of the canvas the background is brushed in with greens and pinks. The area to the right echoes the theme of the trees' foliage with the same colour carried forward to the left foreground by the dead tree in green. 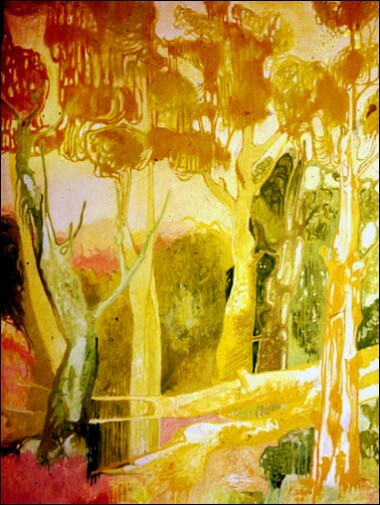 The predominant theme of the canvas is of continual vertical movement relieved by the diagonal of the two fallen tree trunks in white and cadmium yellow in the lower section. The feeling of softness and gracefulness the painting evokes is partly the result of the painting having been executed on a semi‑absorbent white primed canvas and partly the result of using colours in a high register that evoke the qualities of a pastel. The Australian Paintings are available for book illustrations, annual reports, paper and packaging, giftware, related products. You can license them in the following format: Original transparencies in 6 x 6 cm. (2¼ in.) format, high-resolution RGB drum scans on DVD or efficient and quick E-Mail or FTP upload.